At Dearborn, we have all stages of your students’ education needs covered! From prelicensing and exam prep to continuing education and professional development, Dearborn has the highest quality, most up-to-date real estate content for use in your educational programs. Our textbooks and eBooks are written with both students and instructors in mind. A variety of learning features help students easily identify, relate, and master the key concepts they need to know. Most come with supporting Instructor Resources to help instructors lead a successful class. Online delivery options are available for many of our titles and feature innovative technology with proven testing methods and study plans to keep students focused and better organized. We’ve made several updates to the instructional design of our courseware to drive improved student outcomes. Learn more about the product categories offered by Dearborn Real Estate Education. Dearborn’s prelicensing products have helped schools train more real estate professionals in the last decade than any other provider. State-specific prelicensing titles complement our national prelicensing texts with additional content on state licensing requirements and legislation information found on the state portion of the licensing exam. Our flagship prelicensing textbook, Modern Real Estate Practice, has trained over 3 million professionals since 1959. Regularly updated to reflect the current legislation and the most up-to-date market information, this text is a must for aspiring real estate professionals. The 18th edition is more than just a real estate book. Full Instructor Resources are available, as well as Audio CDs, flashcards, and a complementary study guide to reinforce important concepts and provide additional review for mastering the real estate content covered in the main text. Modern Real Estate Practice Online, v18.0, is available for those students who prefer the convenience of real estate online courses. To ensure your students’ success, we suggest supplementing your real estate textbooks with our exam prep guides. These tools help students prepare for formalized testing while conquering their exam anxieties. When used with our prelicensing books, these tools will provide your school with a truly comprehensive real estate prelicensing curriculum that will help your students be fully prepared to pass their exams! Dearborn’s QBank Prepares Students to Pass the Exam! 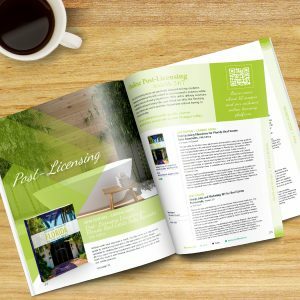 Our post-licensing materials are specifically designed to help students develop and enhance the skills needed to run a successful real estate practice while still meeting state requirements. With online delivery solutions available for all our post-licensing titles, your school can offer the flexibility busy professionals need to meet their requirement without having to attend a live class. Dearborn is committed to providing a wide variety of fundamental real estate continuing education titles that not only meet state requirements to help professionals maintain their real estate licenses, but also cover relevant hot-topic issues to keep real estate professionals in tune with changes in the industry. As real estate professionals look to become brokers, they need to learn to become more effective managers, leaders, and communicators. Planning and organizing an office, hiring and directing a staff, monitoring operations and risk management–these are skills a broker needs to master. Dearborn has the real estate books and courses to help you succeed. Adopting our broker products will give your students an edge in the marketplace and help advance their careers. Available in both print and electronic formats, our broker titles cover national and state-specific content, as well as provide students with the tools they need to establish and manage a successful real estate brokerage. These areas are hot opportunities for growth as real estate professionals look to the next step in their careers. Whether your school is just starting out in these areas or already has a developed program, we have the titles you need to attract interested students and expand your business into these fields. Our appraisal products include prelicensing for the basic, AQB trainee level, which is the foundation for all AQB certification requirements. Our commercial real estate titles benefit both beginning professionals who want an introduction to this side of the industry and licensees looking to move into the commercial market. Designed to be flexible and adapt to any use, from specialized training to meeting CE requirements, these courses offer yet another option to help your school retain students and remain competitive. Used by many of the top training schools nationwide, our home inspection titles attract new students and help boost revenue in today’s competitive market. As more states adopt home inspection education legislation every year, there is an increasing demand for top-quality, affordable home inspection courses. Dearborn offers an assortment of college-level textbooks to support your existing real estate curriculum or to incorporate into a new program. Our college and university texts are written by professional higher-education instructors who are experienced in the real estate industry. These texts are designed to accommodate semester-length classes, and the supporting Instructor Resources offer direction on incorporating all or parts of the content into an existing course. An assortment of titles are also available in eBook format via Follett’s CafeScribe, a digital textbook classroom that allows students and instructors to interact within the text, sharing notes and insights. This format allows integration to most learning management systems such as Blackboard, WebCT, and Moodle. Few topics in the real estate world are more important than finance. Understanding the monetary system, tax laws, investments, home loans and mortgages, and instruments of financial leverage at all stages of the market are essential for all real estate professionals. 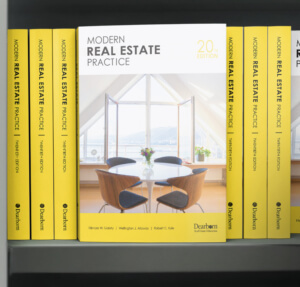 Count on Dearborn to assist your students every step of their professional career with the hottest publications from some of the most respected real estate experts in the industry. Our extensive inventory of textbooks includes today’s most relevant topics. Offering these titles in your school’s bookstore provides real estate professionals with the resources they need to scale the ladder to success, all while generating additional revenue for your school.